Amoebae may be free-living or parasitic. Parasitic amoebae belong to many genera. Entamoeba histolytica belongs to the genus Entamoeba, and it is an important human pathogen. E. histolytica is prevalent worldwide. It causes intestinal and extraintestinal amoebiasis. It is much more common in the tropics including Southeast Asia wherever sanitation is poor. Amoebiasis is a major health problem in Southeast Asia. It is the third leading parasitic cause of mortality after malaria and schistosomiasis in the developing countries. Food and water contaminated by human faeces containing E. histolytica cysts are the main sources of infection. The main reservoir of the infection is the human cyst carriers. Transmission is via faecal–oral, mechanical vectors and sexual contact. The life cycle of E. histolytica is completed in a single host, human. Trophozoites can invade all tissues of human including the intestinal mucosa and liver, which is most commonly affected, followed by the lung, skin and brain. 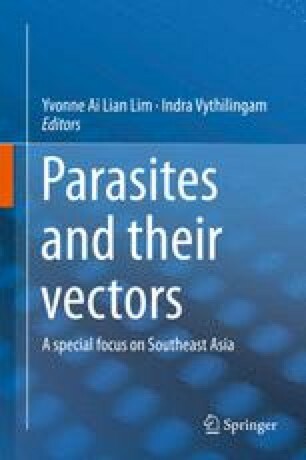 The parasite produces virulent factors which are responsible for invasion and destruction of the human tissue. The typical manifestation of intestinal amoebiasis is dysentery. Amoebic liver abscess is the most common extraintestinal complication of amoebiasis. Diagnosis consists of stool examination, serodiagnosis, molecular diagnosis and imaging methods. Treatment consists of the use of amoebicides, and no vaccine is yet available against amoebiasis in humans. Control and prevention include personal hygiene, proper sanitation, drinking safe water and treatment of cases.